The Station Molds are drawn on drafting paper in accordance with the plan selected from one of the reference books. See: Building a Cedar Strip Canoe. Then, they are traced onto particle board and cut out with a jig saw. 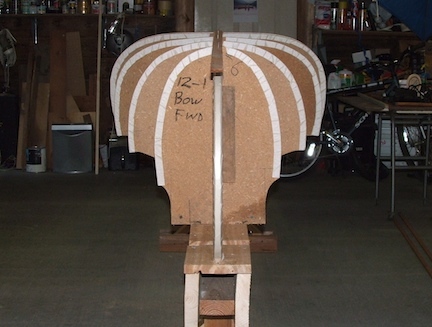 The shape of the mold determines the lines and shape of the canoe. Length, beam, freeboard, height at the stems and tumblehome (or inward curve of the hull as it rises to the gunwale at the center of the canoe) all come from the design of the molds. Also, distance between the molds on the strongback will determine the length and, to some degree, the shape of the canoe. Here the Station Molds are in place on the strongback. The strip at the top of the molds (at the keel line) is there to hold the stations in the proper position until the cedar strips have been installed up to the bilge line, where the hull curves toward the keel line. 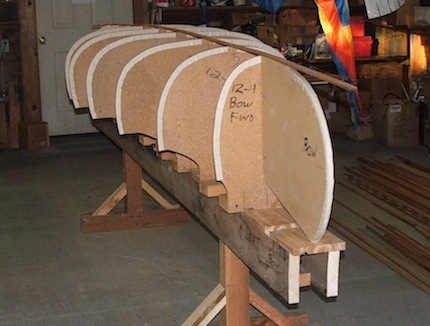 In his book, Building a Strip Canoe, Gil Gilpatrick suggests that by removing some of the molds from the plan for a longer canoe, you can make a shorter one. This is what I have done here. My 15'-8" canoe used 13 station molds (positioned 12" apart on the strongback) plus the stem molds. I removed the center three molds. This gave me a new canoe of 12'-8" in length. The beam would be 2" less, but the freeboard at the center and the height at the stems would be the same. I therefore, have been able to make two quite different canoes with the same set of plans. The masking tape on the edges of the molds will prevent the cedar strips from becoming glued to the molds.